Weeks after the controversy over an alleged slap from Davido to Kizz Daniel’s manager, Tumi Lawrence, Kizz Daniel has announced a change of management to state that he’s now under new management led by Rebecca Junaid of @flyboytexh and also a public relations personnel to manage his public image in the person of Ogaga Sakpaide. 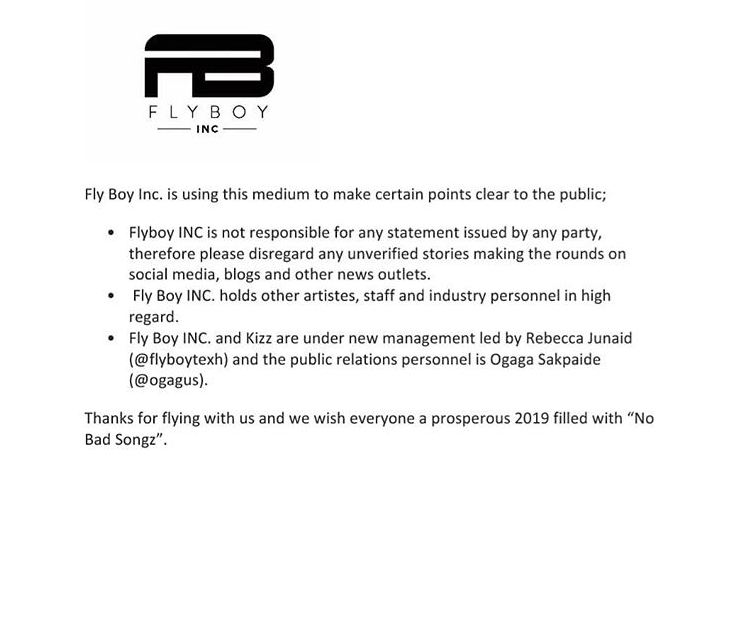 This statement came with a firm intent from Kizz Daniel to debunk any unverified rumours making the rounds on social media either about him or his company, Flyboy Inc concerning the controversy that happened in December at BAFEST. Kizz Daniel also informed fans that both himself and Flyboy Inc are in good relationship with everyone and hold every Nigerian artiste, staff and industry personnel in high esteem while Davido in reacting to the issue has repeatedly denied slapping Kizz Daniel’s former manager Tumi Lawrence. Both Ogagu and Rebecca have reacted in excitement to this announcement, asking fans to follow the artiste’s journey. Reactions are trailing this news on social media as people believe Kizz Daniel has sacked his former manager, Tumi due to the mishap at BAFEST but no word from the artiste is presently stating that and there is presently no word from the former manager.